Hi! I did find some time on this rainy, lazy Sunday to sit at my craft desk. I had a masculine birthday card to make and we all know how much I love that! lol They are always such a challenge for me! I knew the recipient has a boat so I thought I'd go the coastal route for his card. I colored up Beach Path from Shelly's Images. Then I added some glossy accents to the path and covered it with Flower Soft in Sand. I used a Martha Stewart border punch on the mat and then mounted the whole thing on top of a piece of burlap. 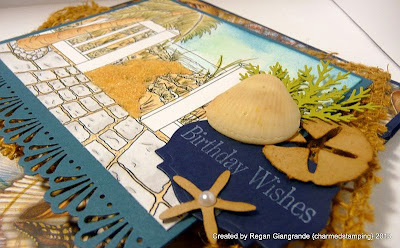 The seashell paper is from K&Company. The only other embellishments I added were a real seashell (Don't tell Kayne; I "borrowed" it from his collection!) and more Martha Stewart punches (branch, sand dollar, starfish). The sentiment is from a Stampin' Up set called Occasional Quotes and is cut with a Spellbinders Labels Twenty-One die. I am off to work on my next project which happens to be the next Simply B Stamps 13 Day of Halloween challenge. The deadline is tomorrow so I'll see you then... Thanks for stopping in and have a lovely evening! Markers used: Copics (E31, E34, BG000, BG0000, YG91, YG93, N0, N2). 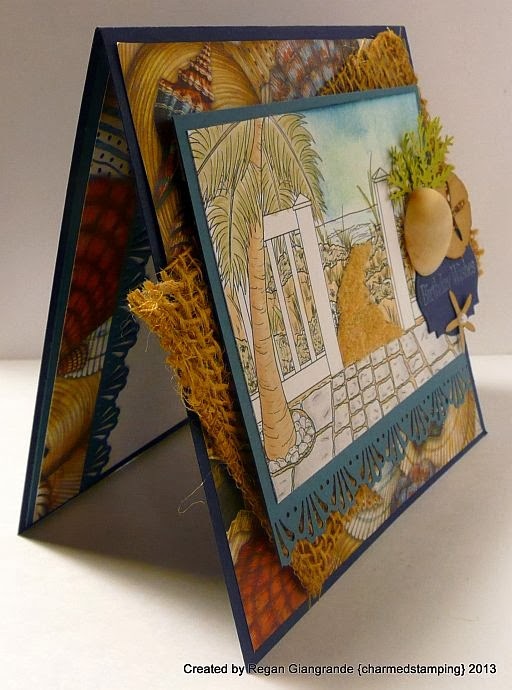 What a lovely card, wish I was on that beach right now! Thank you for sharing at One Stitch At A Time and good luck in our challenge. Hi Regan - this card is so delicious! It reminds me of holidays I have been on in really far away places. The colours are just right, I can almost smell the see just looking at it. I totally love it. Thank you so much for entering it into the OSAAT challenge this week, I hope we see more of your creations soon. Very pretty! Love the fall colors for a beachy scene! I forget that seasons happen at the water , too! 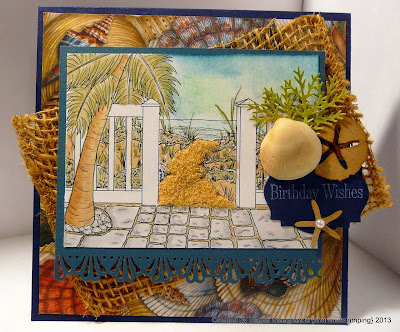 Next time I do a beachy card, I will have to remember yours! Great inspiration! Gorgeous card, Regan! You make wanna take a trip to the beach! Love your clean design! Thanks for joining us in this weeks Anything Goes challenge at Catch The Bug! Hope to see your wonderful work again! Thanks so much for taking time to share your fab project with us at 613 Avenue Create. Have a nice day, a lovely weekend and ... Happy Crafting :). Wow! Love every little bits about this card, it's gorgeous. Thanks for sharing with us at One Stitch At A Time.